You'll Earn 140 Loyalty Points! The Kia'I II is designed with the Hawaiian Lifeguard Association (HLA) and tested daily by its 450+ guards. Upper: Water-resistant synthetic straps. Soft, quick-drying jersey knit lining. Footbed: Anatomical, non-slip, brushed EVA drop-in footbed. Compression-molded EVA midsole. Outsole: Non-marking rubber outsole. Features coral reef lug design for added grip. 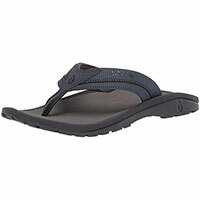 Features: Soft nylon toe post webbing, welded HLA and island chain dtail, and laser-etched HLA footbed logo.